Color World is a location in Mario's Early Years! Preschool Fun. It is one of the six islands in the game and is represented by the a group of balloons. In this world, the player has to select the color specified. 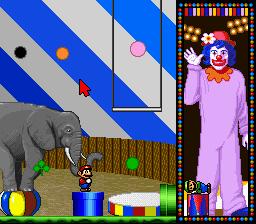 The first level involves selecting the specified color shape to place upon a clown's outfit. The second level involves choosing the selected colored fruit. The third involves finding the required colored vegetable/fruit. After the player selects the correct answer, a character pops up to encourage them, then after a set amount of correct answers they move on to the next room via a pipe. The first area is the main tent of a circus, with a clown off to the side and an Elephant as a platform. The second area is produce section of a supermarket, with a plastic bag roll being used as a platform. The third area is the vegetable section of the market; the player exits through a blue pipe in this room. This page was last edited on February 16, 2019, at 20:27.